Use: They are intended for the creation of fine art works. Artists, pupils and secondary school students can use them. The paints posses stable viscosity and are easy to apply on a surface. They can be applied on paper,wood and mineral bases. The paints can be diluted with water and are produced in 10 basic shades. 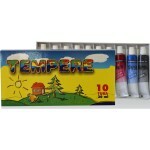 Method of application: They are applied with an artist’s paintbrush or spreading knife.